Brian Williams helicopter RPG story: Anchor recants claim to have been aboard craft. Williams at a veterans’ benefit in 2010. Update, 11:00 p.m.: Brian Williams apologized on-air tonight for claiming that he was in a helicopter hit by an RPG in Iraq, but the version of events he gives in his apology is vague in a way that avoids addressing the main accusation of the soldiers quoted in Stars and Stripes questioning his accounts of events. Those soldiers, in Stars and Stripes’ telling, say that not only was Williams not in a helicopter that was hit by an RPG, but that he was nowhere near the helicopters that were actually fired upon. Said Williams tonight: “I made a mistake in recalling the events of 12 years ago. … I want to apologize. I said I was traveling in an aircraft that was hit by RPG fire. I was instead in a following aircraft. We all landed after the ground fire incident.” Williams’ apology is reminiscent of his original reporting on the incident in 2003, which the Washington Post’s Erik Wemple has located and posted. Stars and Stripes wrote today that Williams—post-apology—still believes that this initial account is accurate. We are one of four Chinook helicopters flying north this morning, third in line. As we head toward the drop point the Iraqi landscape looks quiet. We can see a convoy of American troop carriers and supply vehicles heading north. All four choppers dropped their load and landed immediately. However, Stars and Stripes’ piece says unequivocally that Williams’ helicopter was not part of the group that was fired upon—not third in line, and not part of the line at all. … Crew members on the 159th Aviation Regiment’s Chinook that was hit by two rockets and small arms fire told Stars and Stripes that the NBC anchor was nowhere near that aircraft or two other Chinooks flying in the formation that took fire. Williams arrived in the area about an hour later on another helicopter after the other three had made an emergency landing, the crew members said. The soldiers quoted by Stars and Stripes say that they recall being upset at the time by the inaccuracies in this 2003 version of events. Wayne and I were riding along as part of an Army mission to deliver bridge components to the Euphrates River, so that the invading forces of the 3rd Infantry could cross the river on their way to Bagdhad. We came under fire by what appeared to be Iraqi farmers with RPG’s and AK-47’s. The Chinook helicopter flying in front of ours (from the 101st Airborne) took an RPG to the rear rotor, as all four of our low-flying Chinooks took fire. In his apology statement today, Williams said that re-reading his 2008 post helped him remember what had actually happened. But his 2007-2008 versions of events don’t seem to be in line with Stars and Stripes’ account or his own disputed 2003 account. I’ve reached out to an NBC Nightly News representative about the continuing inconsistensies and will post any response they make. 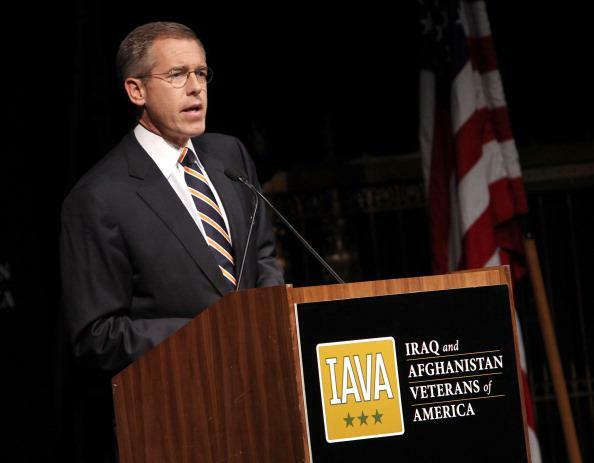 Original post, 6:45 p.m.: NBC News anchor Brian Williams has recanted a claim, made on air on Jan. 30, that he was aboard a helicopter in Iraq that was hit by rocket-propelled grenade fire—but his recantation itself is still at odds with the version of events given by soldiers. In the course of introducing a Jan. 30 segment about a veteran he’d met in Iraq, Williams said that the helicopter he was traveling in during a 2003 trip to Iraq “was forced down after being hit by an RPG.” In a new statement, Williams admitted that he was not on the helicopter that was hit, writing that he did not mean to dissemble and believes he confused his memory of the situation because he’d watched footage (taken by the NBC crew he was with) of the damaged helicopter multiple times. According to the soldiers interviewed by Stars and Stripes, though, Williams’ Chinook was nowhere near the fire and actually landed next to the fired-upon helicopters because of a sandstorm. Williams made similar claims in a 2007 post, writing that the four helicopters took fire and landed together. No footage of that segment has yet surfaced, but three soldiers interviewed by Stars and Stripes say they watched it and recall that it involved the false claim that Williams’ helicopter had come under fire.